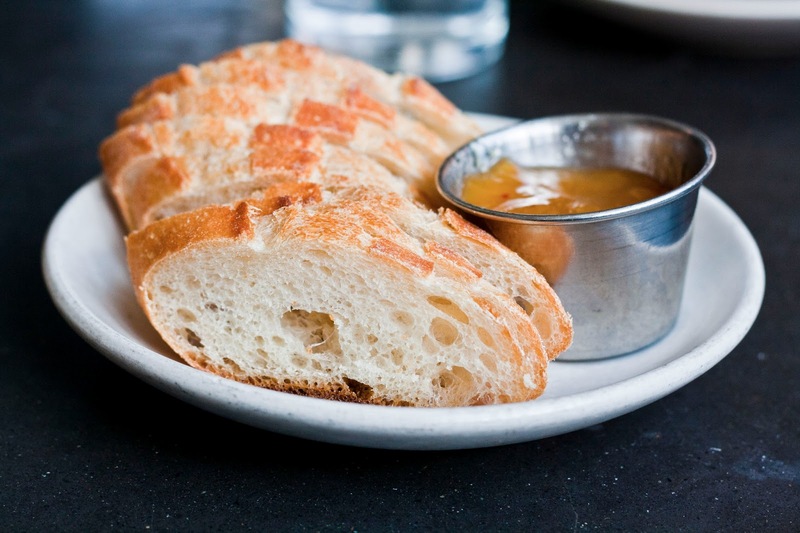 Last weekend, my friend and I went to Olympic Provisions for brunch. Olympic Provisions is a highly-lauded charcuterie and restaurant that cures their own meats right here in Portland. Oregon. They've got two restaurants in the city (one on the east side and on the west). 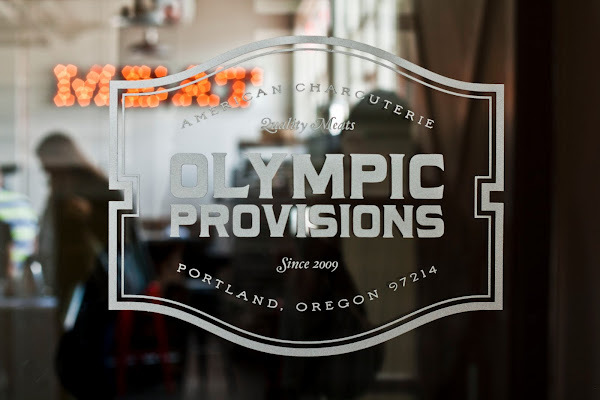 Prior to this brunch, I'd only been to the westside Olympic Provisions once before on a lunch with my coworkers, where we'd spotted famed chef Tyler Florence grabbing lunch. But truth be told, I was less interested in the celebrity chef sighting and more interested in the hot dog I was eating. I was also busy side-eyeing my coworkers' charcuterie plate, which had looked so incredibly tasty that I still regretted not getting my own several weeks later. So let me tell you — I was extremely excited to finally make it to the east side Olympic Provisions to finally get that damn charcuterie plate for myself. According to Lucky Peach magazine (the slightly pretentious food quarterly journal spearheaded by momofuku's David Chang and former New York Times food columnist Peter Meehan), Olympic Provisions is one of the vendors making truly "American" salami. Historically, the process of making salami (that is, curing meat wrapped in sausage casing) has been a European venture, with products shipped abroad to the US. So why does this matter and what makes Olympic Provisions' salami more "American"? 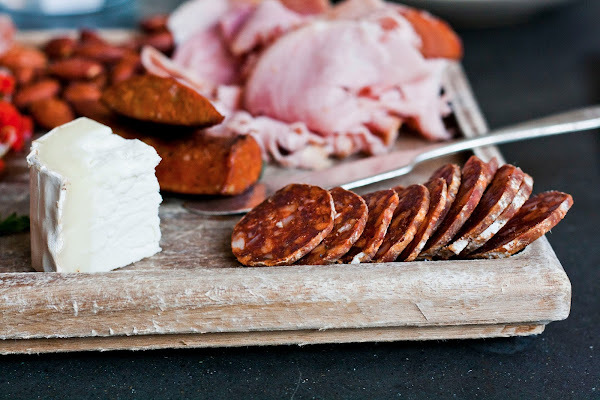 Salami production relies on specific bacteria to acidify and ferment the meat —it's this process that gives salami its unique, salty taste. Because different cities and countries have varying climates, different sorts of flora and fauna specific to the region will grow on the salami, lending the salami a distinct flavor that can only be achieved when cured in that specific region. It literally takes the phrase "regional flavor" to a whole other level. And indeed, according to Lucky Peach, Olympic Provisions' "Sancission D'Arles" salami has as many as five different bacterial species unique to the Pacific Northwest region. The diversity of the microbes is what gives Olympic Provisions salami its unique, salty and delicious flavor, one that can only be achieved in Portland, Oregon. To balance out all that salty meat, the charcuterie plate also came with an awesome baguette (Seriously, does anybody know who supplies Olympic Provisions with their bread? Or is it in-house? Eitherway, I love it) with a side of some sort of spiced, apricot jam. And this is the part where my friend and I got really disgusting. Because we'd run out of bread (despite having asked for ANOTHER platter of bread), we started to dip the potato chips that came with our asparagus sandwich into the jam. It was that good. If there had been nobody around, I probably would have just unabashedly tipped that little ramekin into my mouth. Unapologetically. So, the lesson learned here is this. 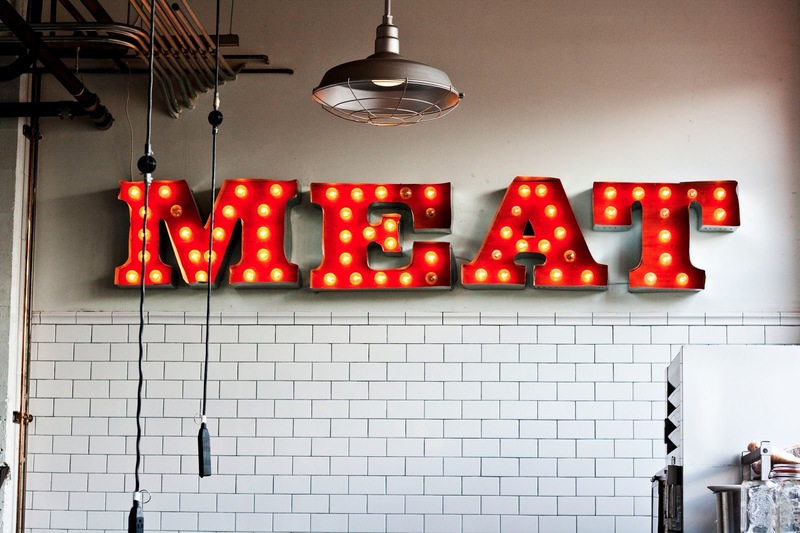 Do you like salty, cured, meat? 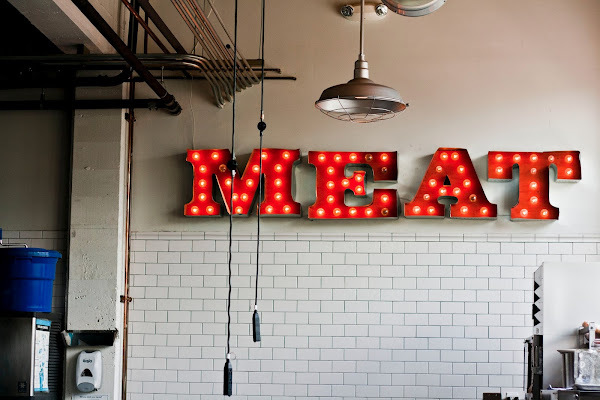 If so, Olympic Provisions is where you need to be. Right now. 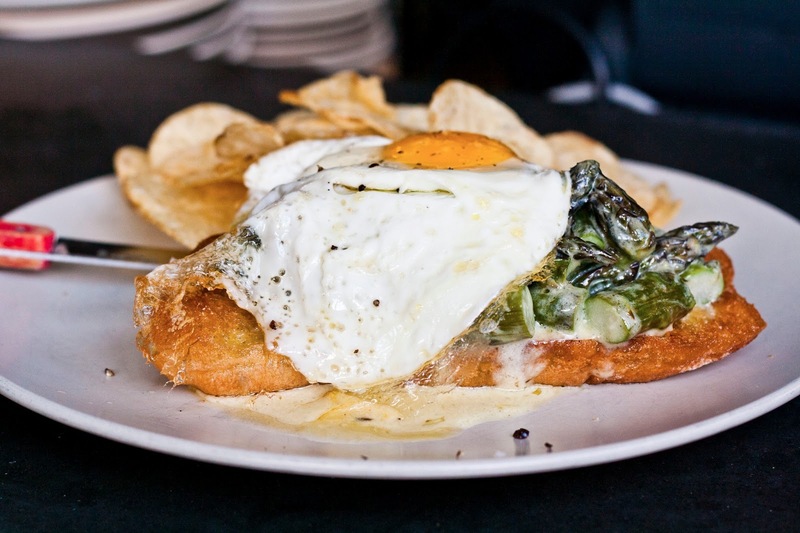 I have yet to go to an Olympic Provisions brunch, but that looks delicious! 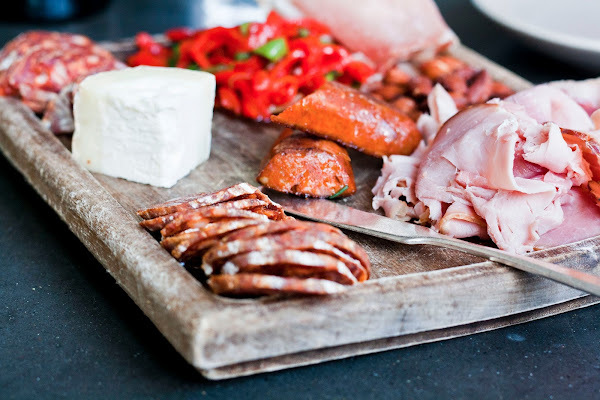 I highly recommend visiting them during the Portland Farmers Market at PSU on Saturdays early because they will slice up several of their different salamis to try, and you can buy it there (or at several local groceries stores) and pack it for a summer picnic! This post makes me want to seriously consider booking a long weekend to Portland with my chef husband and camp out at this place. No lie. I even Expedia'd it.